Try a three day float plane trip to an Adirondack Mountain wilderness pond for trophy Brook Trout with the Adirondacks finest guide service. Whether fly fishing or spin fishing, this remote float plane trip is a truly exciting and easy way to get back to remote areas where the larger fish and game are! From the start of the plane lifting off the water and then landing on a small lake in the middle of nowhere, you will experience the Adirondack wilderness in a way that will leave you amazed. When you want to get away from it all and experience the beauty of our deepest forests, this is the way to go! Miles from the nearest road, civilization is left far behind and the quiet of the woods replaces the noise of the city. The native brook trout in these remote lakes can grow older and larger, some exceeding twenty inches. The most effective method of fishing is by canoe using spoons, lures or flies. Your guide will supply the canoes, tents, food and all necessary gear for a safe and successful fishing trip. 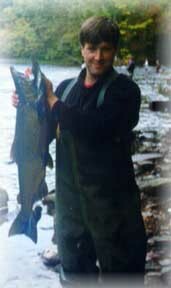 These trips are only offered in the spring when the fishing is at the peak time. Your guided trip includes: Personal instruction with an experienced Licensed guide, a camp cook, bait, canoes, all gear, tackle, food, and overnight in lean-to sites or tents . $750 per person. Price includes plane, canoes, all meals, camp chef, full guide service and all gear. Price based on three person minimum for a three day trip. PayPal payment for deposit, gift certificate or to pre-pay. Try our Big Game fly in trips for Deer and Black Bear. Remote Wilderness adventures for big game. Bow hunting, Black Powder or Rifle. All rights reserved by Ed Lockhart any reproduction, or other use of this site or its elements is prohibited without the express written permission of Ed Lockhart. Deposits are rescheduled due to rain, deposits are non-refundable. Website Development and SEO by Mannix Marketing, Inc.